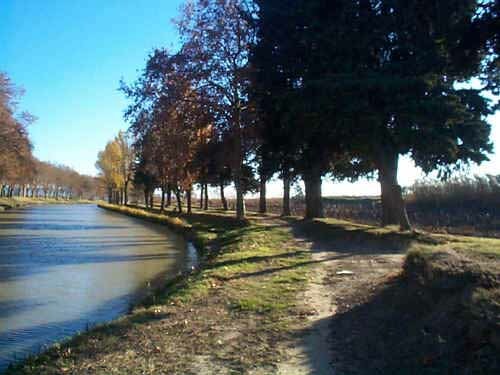 The Canal du Midi, built from 1666, by up to 12,000 men, irrigated from the mysterious Montagne Noir, with grace and beauty that lives on to this day. It runs 360 kilometers, linking the Mediterranean and the Atlantic through 328 structures (locks, aqueducts, bridges, tunnels, etc.) The canal was created by Riquet, the tax farmer for Languedoc who wanted to join the economies of the Mediterranean to the Atlantic. At the end of the Canal du Midi is the Canal du Rhône à Sète and the Canal de la Robine, which links Narbonne to the sea. Now canal boats cruise full of tourists and leisure seekers where king fishers and bright birds sing.